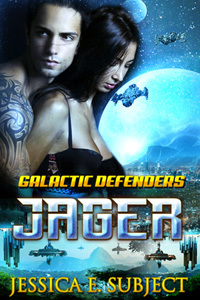 Welcome Katrina from Jager, a new scifi adventure romance. Profession: I'm a Galactic Defender, not a Princess. Species (for scifi/fantasy characters): My mother is Hemera and my father is Kalaren. I can fit in on Earth better than most other Defenders. I have light brown skin with long, dark hair, and dark brown eyes. I'm fit. I need to be to bring down the Erebus. They're not exactly lightweights, and I prefer hand-to-hand combat rather than the plazers and bows the other Defenders use. I don't have an eyebrow ridge like my dad, but I do have the 'V' of freckles across my shoulders and down my back like my mom. I was born and raised on Earth. A couple years ago, my home was attacked by the Erebus. It was after a Galactic Defender arrived to help us that I found out the man who I believed to be my father wasn't my dad, and that I wasn't Terran. Turns out the Defender who arrived on Earth is my dad, my mom was the long lost princess of Hemera, and I haven't been on Earth since that day. But, I'm itching to go back. I know I can't stay there, but I just want to see what's changed, how my friends are doing. I don't have a significant other, like a boyfriend. Jeff Bennett and I almost had a thing on Earth, but I had to leave the planet, and didn't get a chance to say goodbye. My squad leader, Jager, is hot, but we don't exactly get along. And then I have Jace, my best friend. He's the only Defender who has my back, so we spend a lot of time together. But, he's nothing more than a friend. I wear my blue Defender uniform. Though, sometimes when I'm training on my own, I'll wear a pair of leggings and a sports bra. If I lived with my parents on Hemera, I'd have to wear their royal garb. While the lehenga choli I wore for my mother's coronation was beautiful, it's not something I'd want to wear all the time. I graduated from high school on Earth, though I didn't make the ceremony. I was supposed to go to university that fall, but wasn't on the planet to do so. While the Hemera council taught me a bit about Hemera culture, I've learned a lot about the races belonging to the Galactic Alliance as a Defender. I've also learned how to bring down an Erebus by hand. Not stuff I could have learned on Earth. I don't have pockets or a purse—I have no need for them—but I carry my zuranium blade in a special pouch in my boot. It goes with me everywhere I go, because I never know when I'll meet up with an Erebus that needs to be taken out. They're great people, really, just a tad bit overprotective. My mom is now the Queen of Hemera. She's wonderful, and rules far differently than her father and brother did. The commoners are no longer starving and dressed in rags. Everyone works together for the good of the planet. And with the dome the Alliance installed for her, the planet no longer had to worry about an Erebus attack. My dad is a legend among the Defenders. I hope I can be half as good as he was. He was leader of Echo squad for many Galactic years, and killed more Erebus than I can ever imagine. Then there's my sister Gwenodyn. She's not really my sister, but my parents are raising her after the last Erebus attack on Hemera when her mother was killed. She's a sweetheart, but not when she uses her Mingot mind-reading abilities to get her own way. I scratch my arms. It's a habit I wish I didn't have, as it totally gives me away when I'm lying. It would have been nice if you'd given me more than one friend. Though, I wouldn't trade Jace for the universe. And why is this book called Jager when it's supposed to be my story? Thank you so much, Kayelle! It's great to be back. :) Katrina had a lot of fun with the interview.